Skillshare is home to independent thinkers and autonomous creatives who are bold enough to put “Change the World” on their to-do lists, then check it off. Mara Lecocq, the digital creative director at ad agency 72andSunny, has already changed the world. But that won’t stop her from checking it off her list again and again. As a passionate advocate for women in her industry, Mara has long been in charge of forging her own uniquely creative path. She has found a large number of platforms from which she strives to both empower women at work, and remind men to do the same. The most recent achievement on her mission to empower others takes the form of a customizable children’s book entitled Secret Code. This book allows parents to personalize the story’s “tech hero,” so that she closely resembles the child she’s meant to inspire. By personalizing the hero’s name, skin color, and hairstyle, parents can give their girls the gift of meaningful aspiration. Mara’s product is a prime example of great design and purpose. It’s widely being recognized as such, having been already featured on major sites, including Mashable, AdWeek, Fast Company, and Teen Vogue. In tech jobs, gender and racial inequality are a problem, but Mara has found a way to start fixing it when it counts—when children are young, impressionable, and more open than ever to the future’s manifold possibilities. We interviewed Mara to discuss this project, her inspiration and more. When did you get started in creative direction, and what motivated you to do so? I believe what we become is the result of seeds planted in childhood. Growing up in the Philippines, my parents made me take oil-painting classes when I was 5. My dad has always loved music and technology. He bought his first computer before I was born, in the early 80s. He started grooming me to love computers when I was a baby. He taught me to dismantle a CPU when I was 6 (that was 1989). And he bought me a book on how to code in HTML 3 when I was 12. In 1996, I coded my first website from scratch on Notepad—with animated GIFs in the background and rollover animation – it was Facebook Likes 1.0. By creating it myself, I gained a lot of opinions about art, whether it was visual, musical, or technological. I went to art school in Paris, and learned how to draw properly, design, illustrate, and advertise. That’s basically a creative director’s job and at 21, I landed my first ad-agency role. You’re a Skillshare evangelist. Was there a class that was most impactful to your career or your skill set? It was Christine Niyishima’s class on how to create a picture book. By trade, I’m a digital creative director. My expertise is coming up with digital solutions to brands’ awareness problems. I don’t do print or work with paper. I don’t have kids, so I hadn’t read a children’s book in 30 years. I was totally clueless. How do you create a story for kids? How do you write it? How many pages should it be? Christine was amazing. She explained everything so well, and I learned so much. I took notes. And I went on to create my first children’s book, Secret Code. Since then, I won a grant from the Girlboss Foundation, signed with William Morris Endeavor (WME), and received an offer from a publisher. Secret Code should be coming out in bookstores this fall! 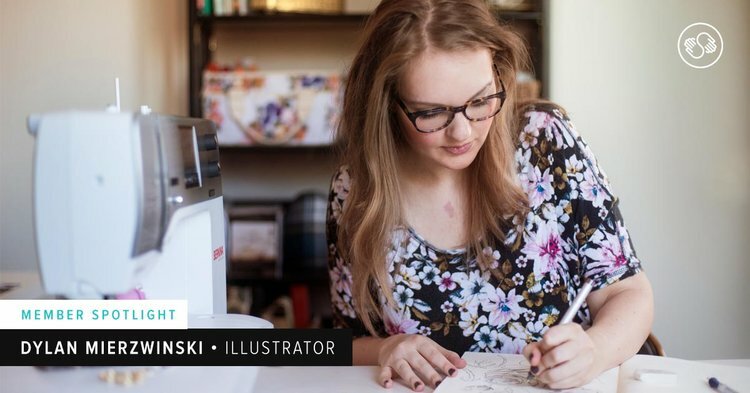 It was a 2.5-year process—from the first time I went on Skillshare to publication. For a total newbie, I think that’s pretty fast, so I feel really blessed. I don’t want to make it sound like it was easy. I had to hustle and endure lots of ups and downs. It was a large investment on my part. I could’ve used my money for a downpayment on a house. To make it happen, I took a break from my job and lived without income for months. Instead of saving for my future, I did this weird children’s book, which took me from moments where you’re like “Wtf—no one cares? !” to amazing times of relief and empowerment. It’s a journey, and you just need to be a little naive to push through. You have to believe in yourself, even if your dad is worried. Could you explain the concept behind Secret Code? Secret Code is a customizable children’s book that stars *your* girl as a tech hero. The way it works is that you personalize the heroine’s name, skin color, and hairstyle. Two weeks later, the reader receives a beautiful children’s book with a story featuring her as a badass robot engineer. My goal was to empower girls of all ethnicities to aspire to succeed in a male-dominated industry like technology. What was the personal inspiration behind Secret Code? Twelve years into my career, I was wondering where I was going. I think we all feel that lack of purpose. Wanting to switch things up. I was working ridiculously hard to make one of 500 ads for huge brands, who really didn’t need more money. You kind of question what the point of it all is. I wanted to set up my next decade. I was also feeling a growing passion about the issue of representation. I was one of the rare female creative leaders in advertising. (It was 11% back then.) So I wanted to do something to get more diversity in male-dominated industries. One of the reasons for this inequality is that girls are not socialized to aspire to ambitious futures. Between ages 5 and 7, children start being influenced by stereotypes, which affects their aspirations and the ways they start perceiving gender roles. As Marian Wright Edelman said, “You can’t be what you can’t see.” So I had an idea: I wanted to affect girls’ aspirations during their formative years by creating an innovative children’s book that made girls literally see themselves as tech leaders. What has the reception been like? “I gave Secret Code to my 6-year-old niece, who hated science. Now she wants to take robot camp, and she plays ‘engineer.'" Check out the video of this adorable little girl, who’s playing coder. It was shot the day after she read the book. She’s dressed like the main character! Let's talk about the people behind the Secret Code product. I rallied former coworkers to make Secret Code happen, such as Nathan Archambault (a writer) and Rodolfo Dengo (a tech director who I’d worked with at my previous agency, AKQA New York). The last piece of the puzzle was when I hired illustrator Jessika Von Innerebner. It’s really important to get support from people you’ve worked with in the past, who you trust and who trust you back. No one could afford a senior writer, a tech director, and a creative director to get this kind of project off the ground—unless you’re a Fortune 500 brand. You need passionate people, who are willing to donate their time for a cause. Only friendship and trust can make it happen. Do something that’s in your wheelhouse, because you’ll do it better than everyone else. And you’ll have the network to help you. It is SO important to have that network. What skills are most necessary for someone looking to run their own creative business? Beyond basic skills, you need access to mentors and a network. I know a lot of people who have no patience, and want to get started right away, in their early 20s. And there’s definitely no shortage of talent. Kids today are amazing, and way more advanced than older generations at the same age. That being said, I do always recommend sticking it out for a few years and working closely with a leader at a company that could potentially buy your product. But I’m not saying that’s the ultimate goal. If you want to start a subscription-model food business, work for Blue Apron. If you want to start an innovative dance studio, work for Equinox. Learn those hard skills, and meet your future partners, who will join you on your venture. They’ll be highly qualified and passionate about your cause. It’s the best tool for recruitment and education to invest in. What's the best advice you could give someone looking to advance in a career like yours? Do something you care about. Solve problems you care about. Nerd it out. You know, be that person who can spend 10 hours on something, which seems embarrassing because you’re addicted. When I was 15, my parents left me alone in the house for a month to go on vacation. I would spend 17 hours a day coding. I only ate cereal, because I couldn’t stop working. I would work on building my website until 5 AM, then wake up the next day and work on it til 5 AM again. For a month. I never told my parents that I only ate cereal, simply because I didn’t want to waste one minute. If you’re passionate about something to an embarrassing point about something, that’s what you should be doing. And please don’t feel like you should do something because society thinks it’s cool. Don’t chase the job title or the money. Do something that your heart really wants to do. It already knows. Don’t search too far. Don’t overthink it. Try it. Learn from it. Find out if you love it so much that you can maintain it. Then you’ll attract the people who will either inspire you to continue, or lead you into the next stepping stone of your life. Down to meet more cool Skillshare members? Older PostEarn $50 When You Refer Your Friends & Family to Teach on Skillshare!